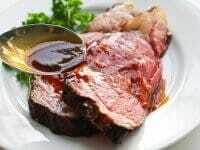 Food That Rocks: Prime Rib With Red Wine Ajus~ Had Enough Turkey? A Prefect Way To Escape The Bird This Christmas! 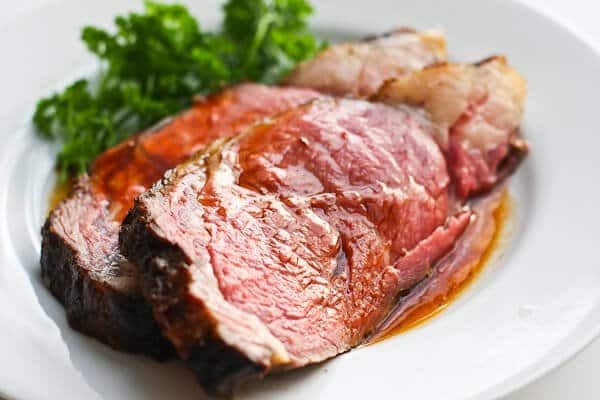 Prime Rib With Red Wine Ajus~ Had Enough Turkey? A Prefect Way To Escape The Bird This Christmas! The first meal I ever cooked for my parents and brother was when I was I was 26 years old. Yeah, believe it or not, I never cooked at all for my family, the kitchen in our home was Mom’s domain and us “kids” were relegated to boring kitchen duties any time we stepped foot on the linoleum. Ahhhh young grasshoppa has talent! That would have surely beat washing dishes! Each year for the holidays, usually Christmas dinner, I’ll make the prime rib roast. 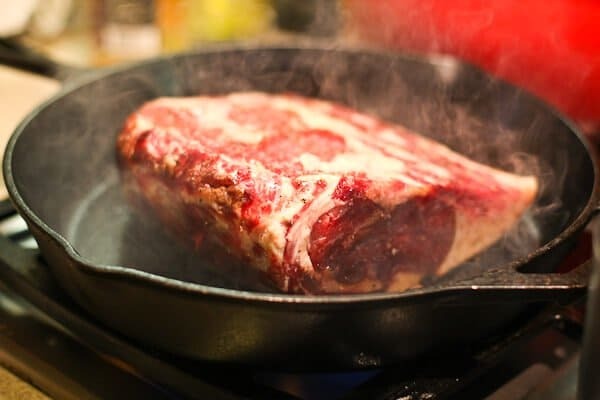 The recipe has changed very little, a hot sear and then slow and low is the key to absolutely perfect prime rib. 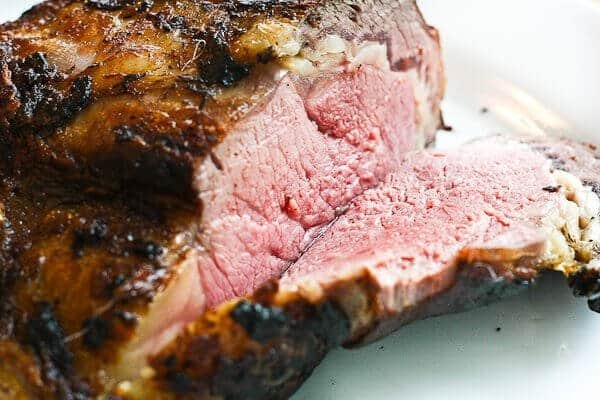 Don’t be fooled by the word “prime” in the name of Prime Rib Roast – just regular ‘ol supermarket Choice cut rib roast is fine, no need to splurge (and what a massive splurge that would be!) for the Prime cuts. These days, I like to dry age my roast (This weekend would be the perfect time to start the dry aging if you are game to do it yourself! ), but it’s absolutely not necessary. The recipe I use most comes from Cook’s Illustrated with some small changes. It’s come out perfect every single time. 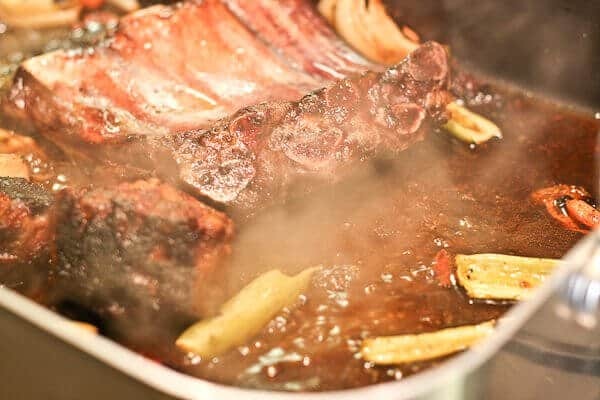 Start with oxtails smeared with tomato paste – this will produce some crazy flavor for the Red Wine Jus (which honestly, is 42% of why I love Prime Rib). Throw some veggies into the pan and roast for 20 minutes to give it a head start. After the oxtails and veg have had a nice bake in the oven, you can already see how much flavor it will add to the recipe. 1. It’s easier to carve to serve without having to wrestle with bone. 2. The bone will flavor the au jus later in the cooking process. 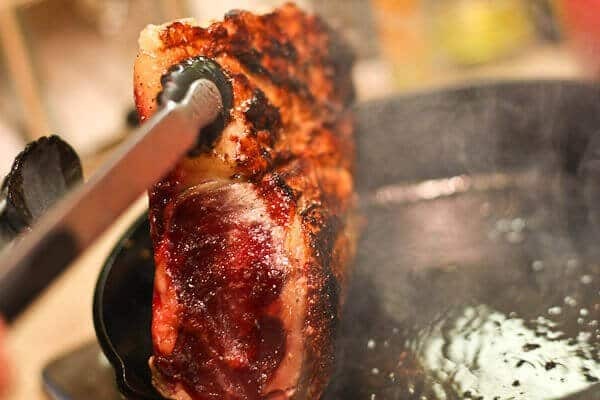 You’ll want to cut the roast as close to the bone as possible – don’t waste any of that precious meat! 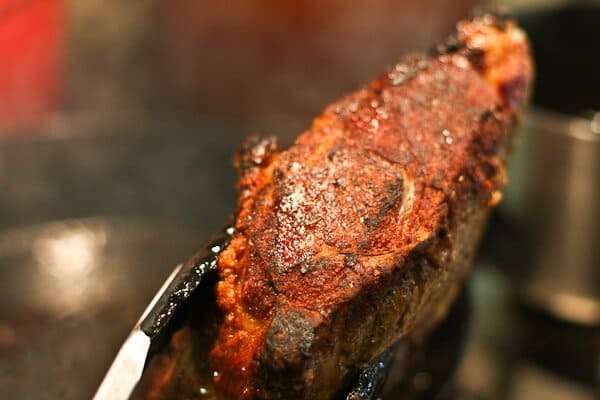 In a large frying pan or cast iron pan (preferred), sear each side of the boneless roast. Get a nice crusty crust. Now we’ll tie the roast back onto the bones. I like using strips of cheesecloth. Easier than wrangling with twine and that fancy tying thing. Two strips is all you really need – tie it like a present. 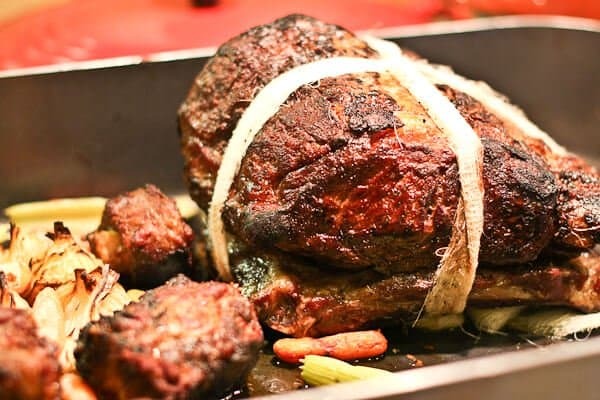 Tie the roast back on — this is important, because the bone will serve as our “rack” in the roasting pan so that the roast cooks evenly. 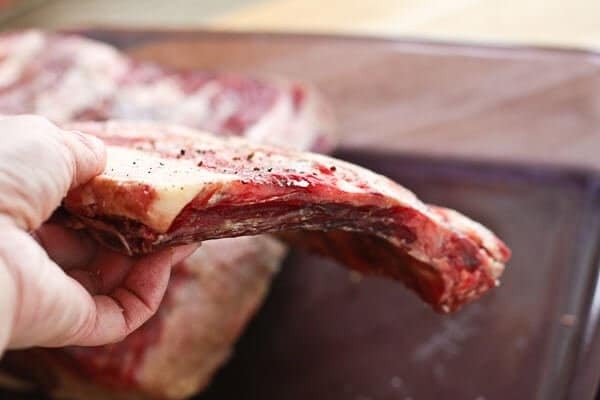 The bone also gives a lot of flavor. Push the oxtails and veg to the side. Roast 17-20 minutes per pound…for a 7 pound roast that would be 2 hours. Check temp with a meat thermometer – just stick the thermometer deep in the middle (don’t touch bone). 122F for rare, 130F for medium-rare. Now it’s time to make the savory red wine jus! Spoon out the fat from the roasting pan (use it for the Yorkshire Pudding Recipe!) 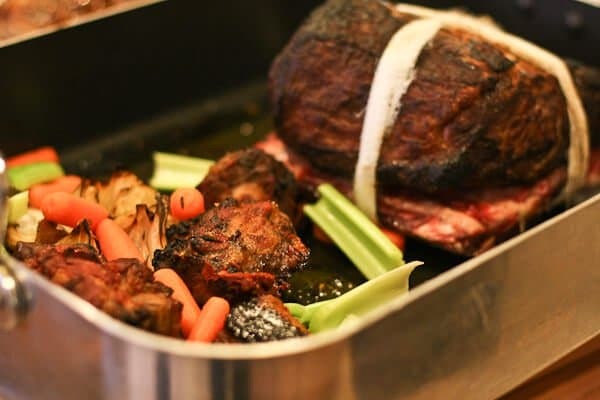 Return roasting pan with the oxtails, vegetables and the BONES of the rib roast (just untie them from the roast) with wine, broth and thyme. 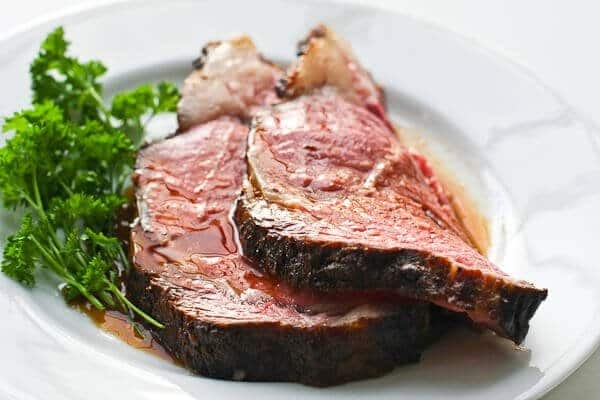 Carve the prime rib roast. Oh look! 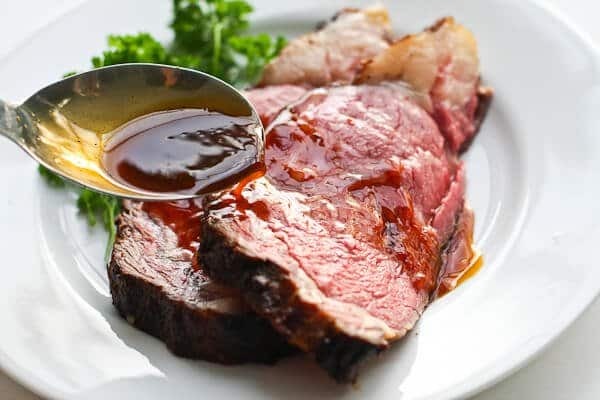 Steph from Faye Bernoulli blog made this Prime Rib recipe. Here’s her photo. 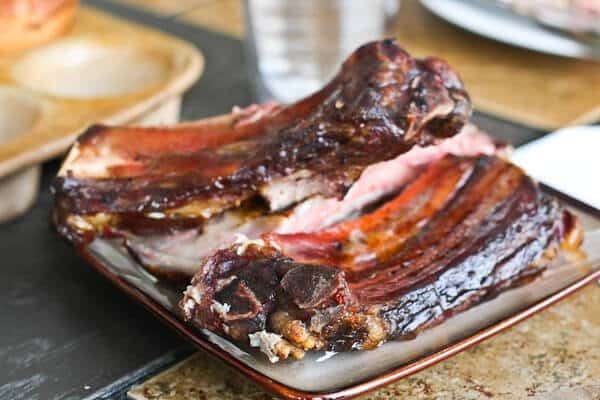 1) Get bone-in rib roast, preferable first-cut, ribs 9-12 for most flavor. Choice grade of beef (i.e. not the pricey Prime grade) is what you'll ask for. 1. 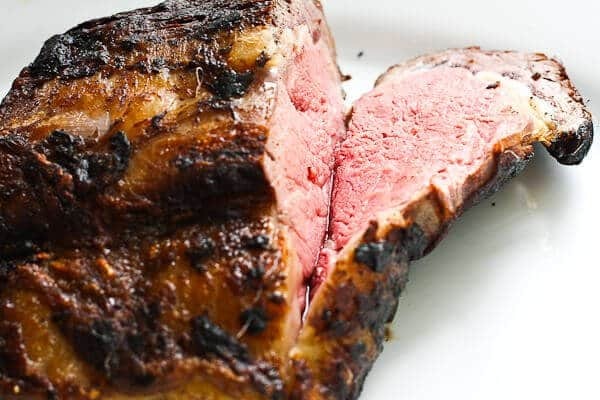 Take roast from refrigerator and let stand at room temperature for 2 hours. Preheat oven to 400F, place rack on lowest position. 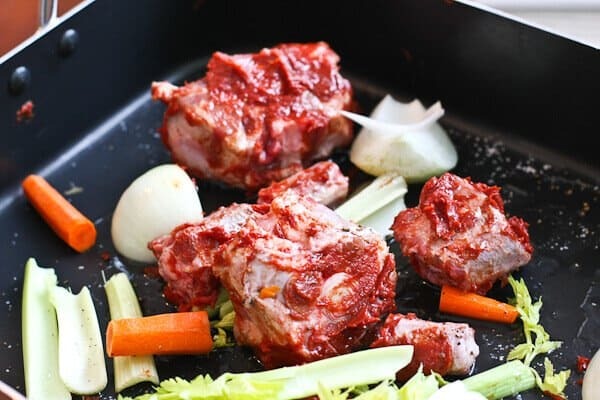 Rub oxtails with tomato paste, place in roasting pan. Add onions, celery, carrots and garlic, toss with just 1 tablespoon of the cooking oil. Roast for 20 minutes. 2. In the meantime, cut the bone from the rib roast (try to carve as close to the bone as possible). 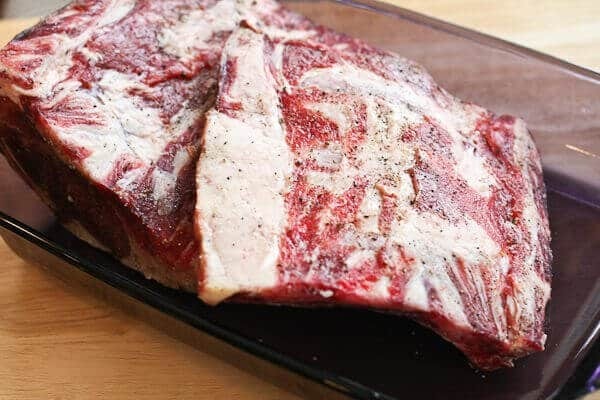 Rub roast with remaining 1 tablespoon oil and generously season with salt and pepper. Heat large frying pan on high heat. When smoking hot, place rib roast, fat side down in pan and sear each side 5 minutes. Remove from pan and let cool for a few minutes. Place the roast right back onto the bones. 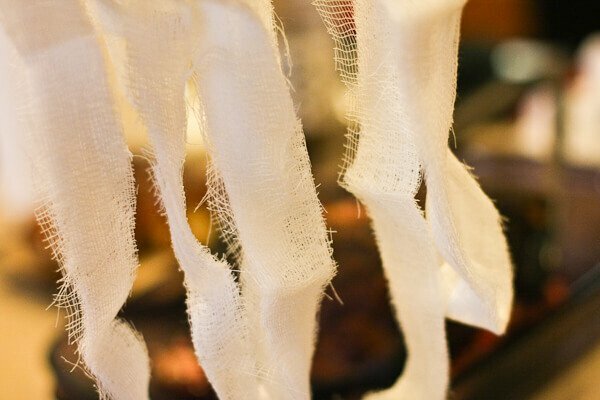 Use kitchen twine or strips of cheesecloth to tie roast back onto the bones. 3. 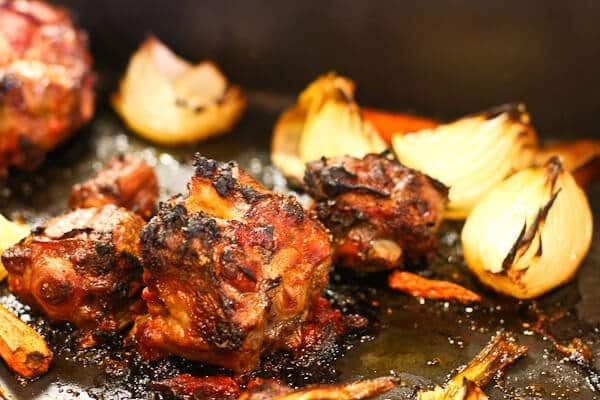 When the oxtails and vegetables are done, remove pan from oven. 4. Reduce the oven temperature to 250F. 5. 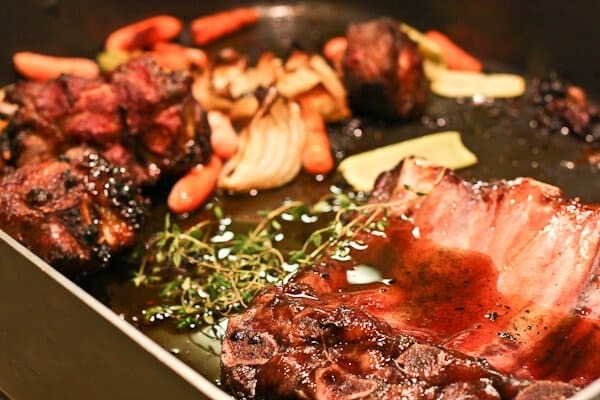 Push the oxtail bones and vegetables to the sides, place roast, bone side down in roasting pan. Return pan to oven. 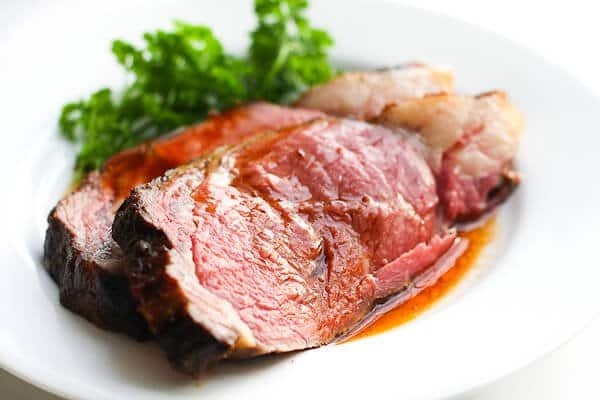 Roast for 17-20 minutes PER POUND or until temperature of the middle of the roast is 130F (medium-rare to medium). Transfer roast to cutting board, carefully untie the bones from roast. Cover loosely with tin foil. Rest for 20 minutes. 6. 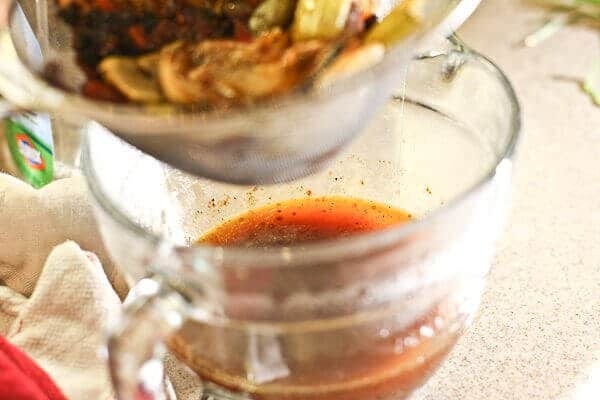 While roast is resting, make the red wine jus. Keep the oxtails and vegetables in the roasting pan but pour out all but 1 teaspoon of the fat (reserve for Yorkshire Pudding if desired). Place the bones that you've untied from roast in roasting pan 2 burners set on high heat. 7. Pour in the red wine and cook until wine is reduced by half. Use a wooden spoon to scrape up the bits. Add the beef broth, chicken broth, thyme. Turn heat to medium-low and simmer for 15 minutes. Add any juices accumulated from the rib roast on the cutting board. Turn off heat. 8. Remove the oxtails and the bones. 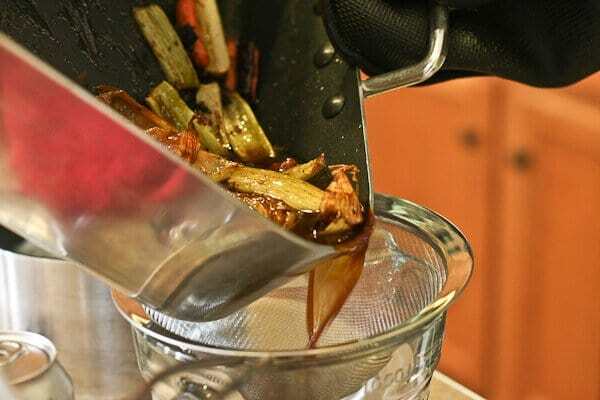 Strain the jus with mesh strainer, pressing down with wooden spoon to extract out all the juice from the vegetables. Carve the roast, serve with the jus. Give the bones to a nice dog.